As the year of 2012 unfolds there is a looming threat growing in the heart of Japan. As a large earthquake centered near the base of Mount Fuji shook the greater Tokyo area bringing to light the fearful reality that indeed the land of Japan could be going through another large scale seismic event but this time at its very heart near the capitol and metropolitan area of Tokyo. Throughout Japan's history Mt. Fuji has been a sign of beauty but also of fear and massive destruction. Every 350 years or so it has been known to erupt covering the land in ash and destroying thousands of towns and leaving the local people in desolation. It has been reported that clouds of steam more than usual have continually been spouting from Fuji-san. There is little snow near the cone due to the heat that has been generated as of recent. The shallowness of the earthquake on January 28th could be revealing that indeed Mt. Fuji is beginning to activate. Japan's government officials are concerned but still have not raised the level of warning for the public. Awaiting more evidence, they are urging people to be ready and make preparations and that safety drills be increased. The official statement of the Meteorological Agency is "there is no clear connection to any earthquakes and a sign of eruption." Below is a video that discusses the strange occurrences around the Mount Fuji area, mainly being the amount of water flowing down from the mountain that would indicate volcanic activity. Also thousands of bats are being found usually in the lower areas near the mountain indicating that these animals are escaping from something. The people have never seen this before in their entire life. This other video depicts the disastrous consequences if Mount Fuji were to erupt which is bound to happen according to its usually cycle every 300 to 400 years. In a matter of hours Tokyo would be as black as night. All transportation would cease, water would stop, and so would electricity in a few hours after the eruption took place. The volcanic ash would cover all of the region causing roofs to collapse and people would begin to struggle breathing due to the ash. Also rain and lightning and other weather would continue to worsen the situation. The imagery of this video is a dramatized simulation. The truth is that nobody knows what is going on and it is best to be ready for the worst and have a plan for the dreaded day that Mt. Fuji erupts. 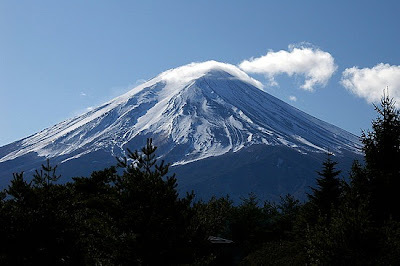 I will post more on the science behind Mount Fuji and its inevitable eruption and how Japan must be ready to handle its aftermath in this century. I hope it dosen't erupt, seeing how I live in Fuji and see Fuji-san up close everyday! Some Japanese seem to think its getting hotter and ready for another eruption, however most of the elderly people I talk to in town tell me that there is no snow on Fuji becase it is so windy on top of the mountain and it happens like that every ten years or so during a warmer winter. That seems to make more since, though the Japanese do like a good end of the world senerio! Looking out the window now its covered in snow and beautiful as it has always been. If it does blow, there isn't much anyone living here could do about it. Thanks for the entertaining post!Hope you and your family are well!